100% Design forms part of the heart of London Design Festival, presenting leading national and international exhibitors with ideas, products and innovations for the domestic, workplace and built environments, alongside a special focus on emerging brands. 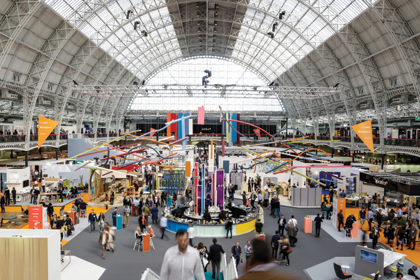 Reflecting 100% Design’s focus on quality and inspiration, this year’s theme is ‘Experience’, which will be explored across the show through specially commissioned installations, immersive experiences and sensory experiments. Talks with 100% Design will be curated by the Design Museum as part of their ‘on loan’ campaign with activity out and about in Kensington until the museum opens there on 24 November 2016. Focusing on quality and depth, the talks present thought leaders in the industry, deliver agenda-setting keynotes alongside panel discussions exploring trends in contemporary practice as well as the future of design. The programme will be presented in a specially commissioned auditorium, designed by Miska Miller-Lovegrove. A separate talks programme focusing on professional development will be presented in the Forum. New for 2016, a cinema area will showcase products, designers and studios as well as providing reflective, intellectual engagement with current and historical design agendas. Making its debut at London Design Festival 2016 is LuxuryMade, a new show dedicated to contemporary decorative interiors. Staged alongside 100% Design close to the site of the new Design Museum, it is the latest addition to the West Kensington area’s burgeoning design offer. The longest running of 100% Design’s five sections, Interiors presents leading international brands exhibiting everything from furniture and lighting to fabrics and accessories. New exhibitors for 2016 include German furniture specialists Axel Veit, who are presenting for the first time in the UK, veteran glass-makers B&S Glass Industries, lighting and furniture studio Industville. 100% Design’s Workplace section reflects the growing appreciation for workplace design worldwide, the section presents the ways in which the world’s most innovative companies are using design thinking to improve the experience and productivity of the workplace. New exhibitors for 2016 include commercial furniture brand Arper, who will host the 100% Design digital hub, and workplace acoustics experts Texaa. Exhibitors in Kitchens & Bathrooms include ceramics manufacturer Porcelanosa, bathroom fittings specialists CEADESIGN, bathroom design companies antoniolupi and KALDEWEI, natural stone experts Antonio Luigi & C. and boat outfitter TIMAGE. Natural stone supplier Marmi Strada joins the show for the first time, while Armac Martin will premiere its 2017 collection of high-end brass cabinet fittings. Design & Build features a materials showcase, technology and home automation, as well as a curated architectural lighting showcase; ‘The Darkroom’. Visitors will experience the materiality of the show through a bespoke installation showcasing innovation in material technologies. Wooden flooring companies CORA’ PARQUET, The Main Company and HAKWOOD make their first appearance at 100% Design. Hedesign will celebrate one year in business at the show, introducing their lamp and coat rack collections to the UK market for the first time, while for rug and pillow designer RedNoir, 100% Design will be their European launch. Other exhibitors in Emerging Brands include interior print designer Mairi Helena, glass and vinyl illustrator Sarah Brown and chair designer Se7e.